For companies conducting business in Europe, 25 May 2018 was quite literally circled on calendars for more than two years since the General Data Protection Regulation (GDPR) enforcement date was publicised. GDPR contains provisions and requirements pertaining to the processing of personal data inside the European Union (EU) and applies to all enterprises doing business within the European Economic Area. While compliance does require a major shift in processes for businesses, the GDPR aims to simplify the regulatory environment for international business by creating a universal application of data protection and privacy across Europe. Forward-thinking businesses undertook months of planning and developing processes to comply with new regulations ensuring they could continue to serve their customers and partners based in the EU. 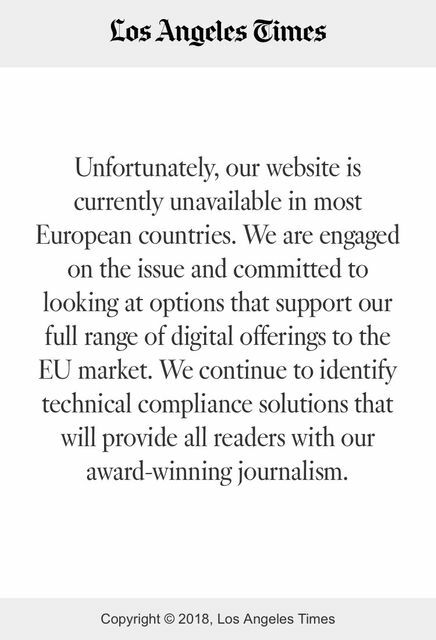 Unfortunately, many enterprises – including US-based media companies – neglected to put in place appropriate procedures for European visitors to their websites. By the morning of the 25th, internationally popular news outlets such as the Los Angeles Times and Chicago Tribune had taken the unusual step of making their content unavailable in most European countries. USA Today redirected visitors to a bare bones version of their website with minimal news stories and no advertising. As a communications professional, this is a disturbing development on a couple of levels. First, in a changing industry where digital platforms are increasingly important to readers in informing themselves and to news outlets in delivering (and monetising) content, it’s disappointing to see some outlets essentially decide “taking their ball and going home” is the best approach. Second, several of these news outlets employ foreign correspondents, many of whom report from right here in London. The reaction from their employers will have placed a diminished emphasis on the great work they do and the readers who follow their stories. Furthermore, as a recently relocated US expat whose role is to facilitate transatlantic business growth for our clients, it’s disheartening to see the first major broad-based application of European regulation on US businesses met with a collective yawn by many respected enterprises. In an increasingly global marketplace where borders are blurred by digital commerce, smart companies will take a progressive approach to reaching into markets where American law may not apply. Here’s to moving forward, and to hoping we’ll soon be able to again read the great content from all US media outlets on this side of the pond.